Martyr de mona are a young midlands band who have been building up a good reputation with their live shows - quite a few people who've seen them live have recommended them to me. Unfortunately I've not managed to catch them live yet, so listening to their album will have to do me for now. Listening to the album, it sounds fantastic - the guitars are the standout point for me - some great riffs and melodies, and the vocals work well with this. The album kicks off with "Sever" which immediately starts with some heavy guitar riffs before the rest of the band joing in for the song proper. A very good song that really gets the album off to a great start. "Departed" isnt a ballad - its a metal track still but with a hint of ballad thrown in. "End of forever" is another slow track like "Departed" but with some good heavy bits thrown into the mix as well. 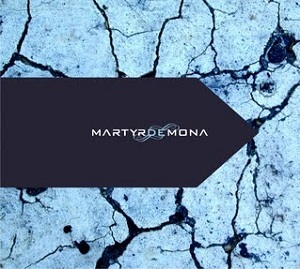 Martyr de mona don't do acoustic ballads, they do slow metal songs with powerful emotional lyrics instead. "The Jackal" is probably my favourite track on the album (it's hard to pick one track when the songs are all so strong), and has great guitar riffs that really make this song stand out. This is a great album - good and heavy but with some amazingly intricate melodies built into the music - this isnt mindless fast and heavy stuff, this is top quality metal. A great album from a band who are quickly making a well deserved name for themselves. Do yourself a favour and give Martyr De Mona a listen - you'll be glad you did.